"Red Shirt Guy", who shot to internet fame last week for his intimidatingly deep knowledge of World of Warcraft lore, has been turned into a character in the game's latest expansion by developers Blizzard. That's him there on the right - Wildhammer Fact Checker - complete with his red shirt. 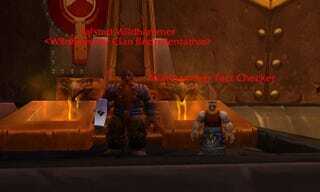 Before you cry fake, Blizzard's Lead World Designer Alex Afrasiabi popped onto the WoW forums to confirm that he is indeed a real character in the World of Warcraft: Cataclysm. Congratulations, Red Shirt Guy; fleeting internet fame is one thing, but being immortalised in the game (or at least in its beta) you love is something way cooler.